The highest-quality, fermented Glutamine is now available in a convenient, easy-to-take capsule. Glutamine is the most abundant amino acid found in muscle tissue. During times of stress, including exercise and athletic events, Glutamine is one of the first amino acids to be oxidized. Supplementation with Glutamine may help to support muscle Glutamine levels, prevent muscle tissue breakdown and increase recovery. * It plays a role in the metabolism of protein while strengthening the immune system and supporting recovery. This important amino acid can help with the removal of lactic acid and prevent DOMS (Delayed Onset Muscle Soreness). 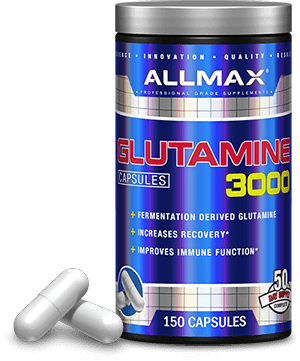 * ALLMAX Glutamine uses Glutamine crystals made from a natural fermentation process. This state-of-the-art process creates a unique, purified and isolated Glutamine ideal for supplementation. It is the most abundant amino acid found in muscle tissue. Glutamine is the most abundant amino acid in muscle tissue and has recently been shown by research to support HSPs (Heat Shock Proteins). Aside from its well-known ability to help exercise recovery, it also helps support recovery by increasing HSPs. * It has also been shown to speed post-workout recovery by increasing the absorption of key electrolytes. Manufactured with the purest raw ingredients at a manufacturing facility. 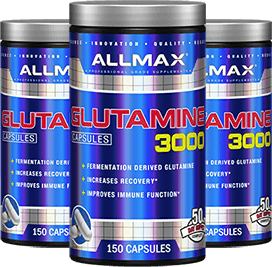 ALLMAX Nutrition fermentation derived Glutamine provides recovery after training and enhances the immune system, which can be compromised during intense exercise. * ALLMAX uses only the purest raw ingredients and is not heated or chemically treated. No Glutamine 3000 Reviews Found. 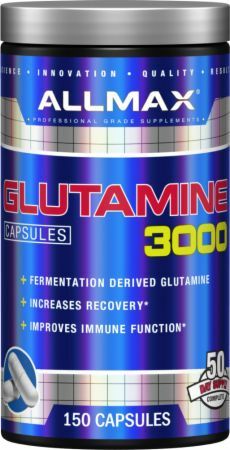 Directions For Glutamine 3000: Take 3 capsules with water or juice upon waking and Pre (and/or Post) Workout, or on non-training days, take 3 capsules after a meal. Warnings: Do not use if you are pregnant or breastfeeding, have a medical condition or are taking prescription medications. Consult a healthcare practitioner before use. May result in weight gain. Not intended for use by those under 18. KEEP OUT OF REACH OF CHILDREN. Store in a cool, dry place.